Give English Lectures for FREE. Give English Lectures for FREE on LELB Society. 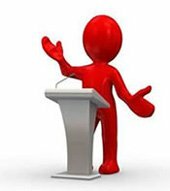 On LELB Society, you have this special privilege to give lectures in English and submit them to us for assessment and feedback. Before recording your lecture and sending it to us, discuss the topic of your presentation with us by contacting us through one of the Follow and Contact buttons at the footer of the site. You should record your English lecture in audio files (only MP3 format). Submit your recorded lecture to us via email at: society@lelb.net. Your proficiency level in English must be at least Intermediate, and your accent must be understandable. The length of your recorded lecture must be between 3 and 5 minutes. After confirming the topic of your lecture, send your recorded file to us through one of the Follow and Contact buttons at the footer of the site. The quality of your microphone must be high enough. Your atmosphere must be completely quiet. If your lecture is approved, we will create a post for that on LELB Society and embed it from our YouTube and Aparat channels together with the transcribed version of your presentation. For educational purposes, the other visitors of LELB Society must be able to contact you if they have any English questions. Therefore, you must create a free account on LELB Society so that we could refer to you as the lecturer. We will also make error correction and provide you with our professional feedback so that you could learn from your mistakes. To listen to dozens of English lectures proudly given by LELB Society’s students, click here. Learn how to give successful and brilliant presentations in English.